Among the “wonder products” generated by the synthetic chemical revolution of the mid-20th century are an array of plastics that today permeate all manner of products and structures throughout the world. And tragically, as learned in the June 14th, 2017 London Grenfell high-rise fire that claimed 72 lives and injured 70 others, the building’s exterior skin – consisting of aluminum composite panels with a polyethylene core plus polyisocyanurate insulation behind the panels — have been implicated in subsequent reports and investigations as playing a key role in the fire’s rapid spread and severity. June 2017. 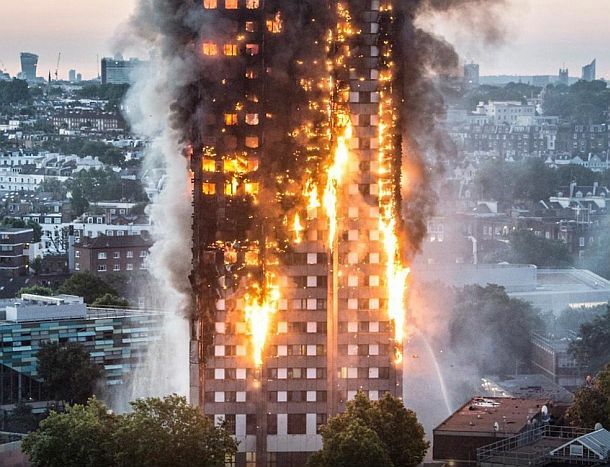 Photo of the Grenfell Tower high-rise fire in progress in London, believed to have been aided in its rapid spread by the building’s exterior cladding; panels which incorporated a polyethylene-filled core, and also, possibly, plastic insulation. 1927 headlines for Cleveland Clinic fire; other headlines note “poisonous fumes from burning x-ray films continue to claim victims” – one of the early plastic-fueled fires. Headlines for 1942 Cocoanut Grove fire in Boston, where nitrocellulose decor was a later-implicated fuel. 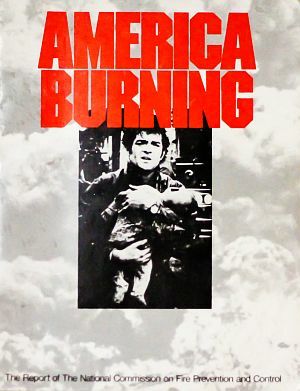 1972 White House report, “America Burning,” was the first such report to signal the special dangers of plastics in fires. For decades, little was known about the special toxicity that came with plastics that burn in accidental fires in homes, office buildings, cars and trucks. But over the years, as major fires have occurred in which plastics have been implicated, more has been learned about their toxicity. Most plastics are carbon-based materials and will burn and give off gases and smoke when subjected to a flame. Burning polyurethane foam, for example, instantly develops dark smoke along with deadly carbon monoxide and hydrogen cyanide gas. Inhaling this smoke only 2 or 3 times would cause rapid loss of consciousness and eventually, death by internal suffocation. Yet, sadly, protective regulations, safety standards and building codes to deal with these and other dangers have lagged behind the learning. The trail of tragedies dates to the earliest uses of plastics, some implicating substances such as nitrocellulose used in celluloid. 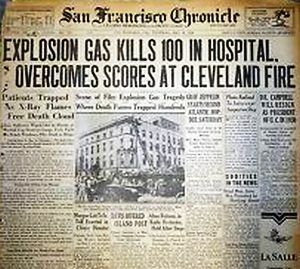 A 1927 fire at the Cleveland Clinic killed 135 people as an acrid brown-black smoke was generated from the nitrocellulose x-ray film used at the clinic. That fire was among the first to be fueled by synthetics. But it wasn’t the last. 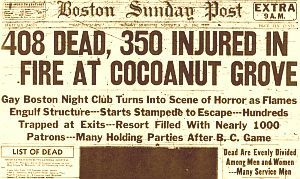 The famous catastrophic 1942 Cocoanut Grove nightclub fire killed more than 400 people. An investigation highlighted some obvious issues in that fire. But only a handful of scientists and investigators knew that the nightclub’s copious decor of nitrocellulose cocoanut fibers was a contributing cause of the resulting death and injury. By the 1950s and 1960s, a wide array of synthetics began filling up homes and office buildings, such as nylon carpeting, urethane foam mattresses, plastic filled soft furniture. and PVC wire insulation. Automobiles, trucks and planes added synthetics material to their construction and interiors as well. During the 1960s and 1970s, airplane crashes in which victims survived the crash but died in a toxic fire began to raise questions about the plastic material inside planes. And the 1969 New York Harbor fire aboard the USS Enterprise killed many sailors after plastic-coated electric cables burned. Following these incidents, a White House report on fire in 1972 — America Burning — noted that plastics were being sold and used without adequate attention to the special fire hazard they presented. But when the National Fire Protection Association tried in 1975 to require by code that material used in construction be no more toxic than wood, the Society of the Plastics Industry blocked the move. In 1974–75, some plastics manufacturers advertised that urethane foam was fireproof and self extinguishing, a claim the Federal Trade Commission challenged, but only resulted in industry’s “rehabilitating the product” to improve its public image. 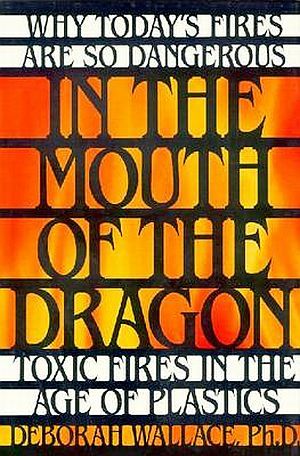 Deborah Wallace’s 1990 book, “In the Mouth of the Dragon,” details the dangers of plastic-fueled toxic fires. Click for book. > the 1983 Fort Worth Ramada Inn fire in which five died from PVC and nylon fumes. Early L. A. 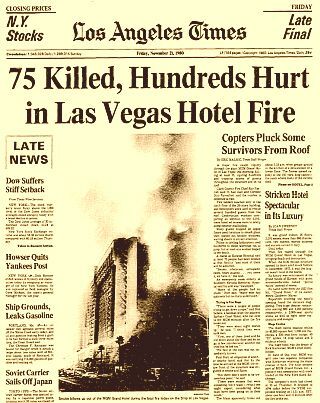 Times headlines on the November 1980 MGM Hotel fire that would finally take 85 lives, with plastics heavily implicated. Added to these are the toxic fires that came during and after the September 2001 terrorist attack on the Twin Towers at the World Trade Center, and the February 2003 fire at The Station nightclub in West Warwick, Rhode Island that killed 100 and injured 230. Burning plastic material played a role in the death, injury and/or debilitation of victims and workers in both of these catastrophes. Although The Station nightclub fire was caused by pyrotechnics set off as part of the Great White rock band’s act that night, the fire’s spread and intensity were aided by ignited plastic foam used as sound insulation in the walls and ceilings surrounding the stage, materials that generated considerable carbon monoxide and hydrogen cyanide within a few minutes. Plastic material was implicated in the September 23, 2007 fire at the Water Club Tower at the Borgata Casino Hotel in Atlantic City, New Jersey where fire raced up 38 stories on the face of the building. And since 2012, fires fueled by metal composite cladding with plastic cores have occurred in high-rise buildings in France, Dubai, and South Korea. Thousands of structures worldwide may be similarly vulnerable. Fires at plastic manufacturing facilities and in storage areas can also yield catastrophic results. In March 2017, spools of high density polyethylene (HDPE) conduit stored below a freeway in Atlanta, Georgia fueled an intense fire there that caused an elevated portion of I-85 to collapse on March 30th. In the spectacular blaze, flames shot 40 feet into the air, and the heat was so intense that it melted supporting metal structures. Both directions of I-85 were closed in a key area of Atlanta near its busy downtown hub. Meanwhile, individual homes continue to be vulnerable to the toxic effects of plastic-fueled fires, as everything from urethane-filled sofas and mattresses to PVC siding, wall coverings, plumbing lines, and molded furniture can provide toxic fuel. Stephen Fenichell's 1996 book, "Plastic: The Making of A Synthetic Century" (Harper-Collins). Click for book.
. . . That burning plastic could release noxious gases equal to any biochemical weapon . . . was dismally proven in January 1970 when an elderly resident of the Harmar House nursing home in Marietta, Ohio carelessly tossed a lighted cigarette into a polypropylene wastebasket filled with waste paper. The burning paper caused her plastic basket to flare up, throwing out flames that rapidly consumed her polyurethane foam mattress, touched off her nylon wall-to-wall carpet, and instantly ignited the carpet’s styrene-butadiene foam underlayer. By the time rescue workers arrived on the scene to evacuate the ward, they were met by a dense, black wall of smoke that obscured their view of survivors still trapped inside. The billowing smoke not only blinded the firemen but was so viciously toxic that it overcame scores of enfeebled patients who might otherwise have been able to escape on their own. By the time the fire was brought under control five hours later, twenty-two elderly people had died. The vast majority, coroners concluded, had been felled by the toxic fumes, not the flames. Eight months later, on a steamy day in August 1970, a twelve-alarm fire broke out on the thirty-third floor of One New York Plaza, a modern high-rise office building in Manhattan’s financial district. A stray electrical spark ignited a welter of computer cables concealed within a dropped ceiling in a telephone equipment room, which was itself filled floor to ceiling with mile after mile of exposed polyethylene- insulated cable. As the heat intensified, flammable and toxic gases were distilled from the polyurethane foam padding cushioning office furniture in the suites below. As the toxic gases burned, the blaze exploded, as if shot from an aerosol can. Fed on this rich diet of toxic, flammable gas, the fire consumed two entire floors covering over forty thousand square feet of office space in under twenty minutes. During the six hours it took to extinguish the flames, two firemen died of smoke inhalation.“Plastics ignite like excel-sior, contribute heat like kerosene, and produce four to thirty times the amount of smoke as non-synthetic materials.” Thirty more were hospitalized with potentially life threatening lung injuries—as the result of inhaling burning, noxious plastic fumes. Only three weeks later, at 8:30 on the morning of August 26, a third blaze broke out in the recently completed British Overseas Airways terminal at New York’s John F. Kennedy Airport. As flames licked across six hundred polyurethane foam-padded benches clustered by the gate entrances, clouds of toxic gas distilled from the benches’ foam padding caused the fire to gallop off down the 35-foot- wide, 330-foot-long corridor at lightning speed . . . As the roaring fire leapt wildly from seat to seat, blowing out dozens of large plate-glass windows in its wake, it took a mere fifteen minutes to consume the entire west gallery of the newly completed airline terminal, at an estimated cost of $2.5 million in damages. *Excerpted from Stephen Fenichell, Plastic: The Making of A Synthetic Century, Harper- Collins: New York, 1996, pp. 308–11. Grenfell Update: In addition to the suspected role that the polyethylene-filled exterior cladding panels may have played in the June 2017 Grenfell Tower fire, an insulation foam product named Celotex RS5000, a polyisocyanurate product, was also used in that building, installed behind the cladding. Some have stated that this insulation was more flammable than the cladding. Grenfell Tower fire near its end, with bits and fragments of exterior cladding and insulation seen in the charred remains. 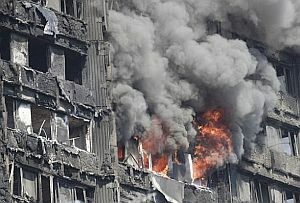 Wikipedia’s entry on the Grenfell Tower fire, with citations, notes that the polyisocyanurate product “will burn if exposed to a fire of sufficient heat and intensity” and that such insulation foams, when ignited, “burn rapidly and produce intense heat, dense smoke and gases which are irritating, flammable and/or toxic,” among them carbon monoxide and hydrogen cyanide. Building and fire codes in recent years have no doubt been updated in many jurisdictions to take account of the toxic effects of plastic materials, leading to safer installations and products. But certainly not everywhere, as the Grenfell tragedy attests. Given the ubiquity of plastics in modern use, plastic-fueled infernos are likely to remain a danger throughout the world. And beyond the fire dangers of modern plastics, there are a whole host of other problems associated with this miracle of inventive science – not least those being, for example: plastics in municipal waste incineration, in landfills, worker exposures in “upstream” chemical manufacturing, plastic chemicals leaching from food packaging and containers, the tons of plastics floating in the world’s oceans, and plastic chemicals and their breakdown products found in human blood and body tissue. 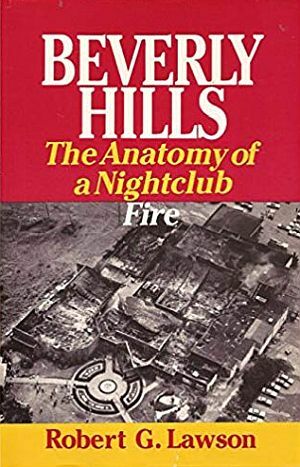 Robert G. Lawson’s 1984 book, “Beverly Hills: The Anatomy of a Nightclub Fire,” Ohio Univ. Press, 228pp. Click for book. 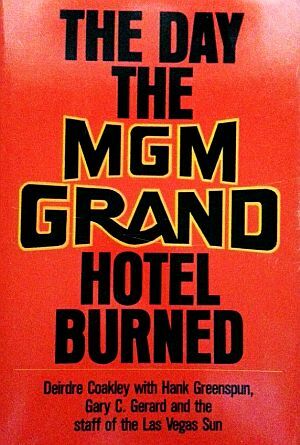 1982 book, “The Day The MGM Grand Hotel Burned,.” Lyle Stuart, 208 pp. Click for book. “London Fire: What We Know So Far About Grenfell Tower” and, “London Fire: Six Questions for the Investigation,” BBC News, June 23, 2017. Robert Moulton, “The Cocoanut Grove Night Club Fire, Boston, November 28, 1942,” National Fire Protection Association, 1943. D.L. Breting, Underwriters Laboratories, “Pretty Plastics–Ugly Fires,” 1954. J. Harry DuBois, Plastics History U.S.A, 1972. Ronald K Jurgen (Editor), “The Great New York Telephone Fire,” IEEE Spectrum Magazine, Vol. 12, No. 6, June, 1975. Richard Best, Investigation Report on The MGM Grand Hotel Fire, Las Vegas, Nevada, November 21, 1980, National Fire Protection Association, Report revised January 15, 1982. Deborah Wallace, In the Mouth of the Dragon: Toxic Fires in the Age of Plastics, Avery Publishing Group, Garden City Park, New York, 1990. 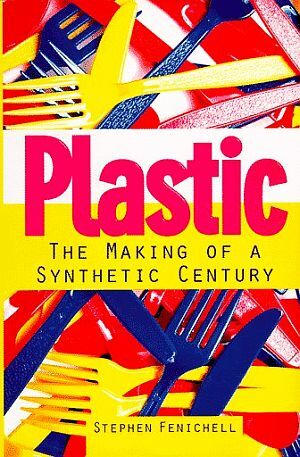 Stephen Fenichell, Plastic: The Making of A Synthetic Century, Harper- Collins: New York, 1996. Robert Burke, “Plastics & Polymerization: What Firefighters Need To Know,” Firehouse, February 28, 1999. Bob Port, “Three Decades After an Infamous New York Telephone Co. Blaze, Cancer Ravages Heroes,” New York Daily News, Sunday, March 14, 2004. James M. Foley, “Modern Building Materials Are Factors in Atlantic City Fires,” Fire Engineering, May 1, 2010. Susan Freinkel, Plastic: A Toxic Love Story, April 2011. Thunderthief, “PSA–Burning Plastic Can Kill You,” DailyKos.com, June 2, 2012. Associated Press, “Fire That Killed Newark Family Fueled by Plastic Flowers,” New York Post, June 17, 2014. Carla Williams, “Smoked Out: Are Firefighters in More Danger than Ever Before? New Construction Materials Are Making Firefighting More Hazardous to the Health and Well Being of First Responders, As Well as Building Tenants and Homeowners,” EHSToday.com, September 7, 2016. Catherine Kavanaugh, “Plastic Conduit Fuels Fire That Brings Down I-85 Overpass,” PlasticsNews.com, March 31, 2017. Justin Pritchard, Associated Press, “Insulating Skin on High-Rises Has Fueled Fires Before London,” ABC News.com, June 18, 2017. “Grenfell Tower Fire” (Polyisocyanurate insulation), Wikipedia.org.